One World One Heart Blog Giveaway! Vibrant red tulips and historical buildings! Now remember to win these magnets, you need to leave a comment to this blog post. then we will announce the winner on Feb 15th! You can find more in my shop at Etsy! Don't forget to check out our give away at our sister company, One20 Farm! What lovely giveaways! I thank you for this opportunity to have one of your treasures. Love the magnets! Great giveaway. ps. I am also giving away #626 Come to my blog and participate! I'm participating too, please stop by my blog for a visit! Sweet! Please enter me in your giveaway. I think these magnets are a riot. These are so neat! And...seeing as I was born in PA, the fact that the postcards are from there is just wonderful to me! Thanks for a great giveaway! count me in and visit me at #220! Way cool magnets!! An artist friend of mine makes necklaces from bottle caps. Love them! I wear 3 at a time! All the amazing people I am meeting on my rounds. i tend to type and read a lot when I visit all the participating blogs. Therefore, I am way behind on my entries. LOL. but i don't want to miss a thing on my travels to find each and every one of you glorious artist people out there! :-) stop by mine to enter too! #30 on the list! That is what your blog does! Here is my link to my OWOH 2010 giveaway at TAJ. Greetings from Maine. What a great idea....I might have to copy it. Please enter me in...thanks. So many I could share with my children and still have some for my icebox. Neat giveaway. Another envinoment focused give away, you are doing very well here. I won some christmas decorations made from reused bottle tops. I love them. This time, if i am lucky enough to win, I'd like to donate the gift to Made4aid (http://made-4-aid.blogspot.com/) to help raise money for haiti. Its een lovely coming here, I feel like having a little peek at your other posts. Love the magnets....please count me in. Coming to Artiscape in Columbus? Stop by and say hello...I will be teaching. Nice meeting you here in the blogosphere. Visit my OWOH blog (#7) at Loose Ends and take a chance on winnning my giveaway too! The magnets are so very neat and love the photos on them. Thanks for the wonderful giveaway. Beautiful creation! Wonderful! Thanks for the giveaway! Thay are cute - please count me in! Fun and very cool!! Would love to be entered in your giveaway. These look real fun! Thanks for visiting my blog. Count me in. I'm a refrigerator magnet collector so please count me in! They are cool and fun!! Wonderful stop on my blog hop. Thank you! # 111 on the magic Carpet ride. This is a lovely way to recycle old postcards. I can see them on my file cabinet right now. i love magnets & postcards! I love postcards and bottle caps, how neat! Please enter me in your drawing. I love altered art and fridge magnets. Very nice giveaway. wow!! they're so pretty - a great way to jazz up the fridge :) please count me in! Sigh... PA... so many good associations with that state! Lots of good people are born there and move South so I have the honor of encountering them! :-) Thanks for your generosity! Love the cap magnets; thanks for a chance to win. You do lovely glass and pc work. Great idea for the giveaway. Please count me in. Cool magnets! Definitely add me to your drawing for these. Awesome magnets. Please enter me and then stop by and enter mine if you have the time. These are so fun! Please enter my name in your draw -- thank you!! Hi Bluegirlink, what a lovely idea and post you have. 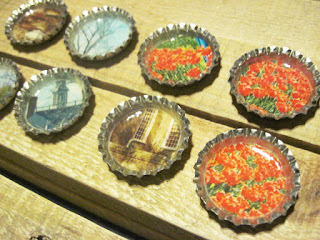 I love the gorgeous bottle cap magnets. I'd love to win. I absolutely love your gifts. Please take time to visit my blog, too, for a chance to win my book, 16 x MOM: A Mastery of Motherhood. I'm working on getting all the country flags. I promise to revisit your's too. wow, great project! i would love to have these! Great idea using them as magnets! Come and enter my draw too! oooh they look like fun magnets!! I can never have too many magnets, although I think that if I get too many more I wont be able to fit them on my fridge!! Flying in from Michigan to meet you- how wonderful it is to be here. 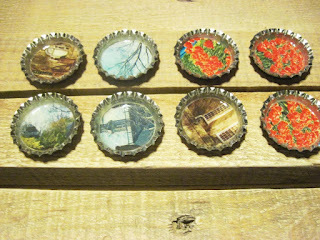 These bottle cap magnets are wonderful and I love to collect them! I hope you will stop on over to my blog: 941. I'll bet when bottle caps were invented they had no idea what ways they could be used for. Very clever. Cute magnets! I would love to add them to my collection. These caps are so cute, please count me in. When you get some time, fly by my blog on your magic carpet. I am OWOH #907. I am so very, very, pleased to meet you. fun givaway and I like red! Please visit for your own chance (#607) to win. With 4 kids still home needing magnets to hang goodies on the fridge, these would be perfect! Too cute! Thanks for the chance to win! Wonderful giveaway! Please enter me and be sure to go to my blog and enter to win! Fabulous and creative way to recycle...good for you. They're great and I would love to display them on my frig! Charming and a beautiful blog with a stunning treasure! Fun and Functional! CUTE magnets, I'd love to win. What a great giveaway! Count me in! Hope you're enjoying the magic carpet ride so far! What a great use for the bottle caps. I love recycled art. I like and would use them! great giveaway - please count me in =) if you have time, i hope you can stop by my blog too! How neat! The little bottle cap magnets are splendid. My mother loves magnets so if I'm lucky enough to win the draw I will share them with her. Your giveaway is terrific! I would love a chance to win. Please add my name to your drawing! Thanks for participating in the OWOH event. Your bottle caps are heavenly! Please enter me in your giveaway, and don't forget to fly my way (#922)! Oh wow... I just LOVE your magnets! Great blog you have too! Please enter my name into your fabulous drawing for a chance to win. Wow! What a wonderful fun giveaway! Please count me in! Wonderful giveaway. Thanks for the chance to win. It's nice to meet you! Thank you for a chance to win your wonderful giveaway! Don't forget to visit all 3 of my blogs as I am giving away something at all of them! Lovely give away, thanks for including me. your magnets are just lovely!! I would love to win, please enter my name into your drawing! And if you haven't already, please enter mine #135 to win 1 of 3 prizes!!! Hi from Ireland. What a lovely giveaway. Please count me in. Hello from England! Cool magnets! I'd love to be included in your giveaway, thank you. I've seen bottle cap bracelets and jewelry, but never magnets- very cool! These are so cute. I am originally from PA so would be thrilled to win one. Fantastic giveaway. I would love a chance to win. Please enter me. I am a silly girl. And of course a friend. Lovely! Yes, please enter me in your drawing! Very cute! Please count me in. Thanks so much! How cute, count me in please. My OWOH giveaway is for one of my fine art photographs - stop by and see what strikes your fancy. Beautiful, please count me in. Fantastic magnets!Pick me up please!